(Phys.org)—A combined team of researchers from the University of Exeter in the U.K and the Institut de Ciències Fotòniques in Spain has found a way to create a material that takes pictures inside hostile environments such as nuclear reactors. In their paper published on the open access site Science Advances, the group explains how they made the new material, how well it works, and future applications. As some scientists invent new ways to produce power, such as nuclear reactors, other scientists refashion old technology or develop something new to keep such systems under control—this includes developing cameras that could operate inside of a reactor to allow administrators to actually see what is going on inside. As the researchers note, one promising area of study is using graphene as a flexible photodetector, but as they also note, the limited power of such devices and their low resolution leave much to be desired—recent research has led to doping of graphene to improve its limitations. In this new effort, the researchers started where other teams left off, with iron-chloride molecules added between graphene layers resulting in FeCl3-intercalated few-layer graphene (FLG). To use the FLG as a photodetection device, the researchers applied a laser to extract some of the FeCl3 molecules, resulting in junctions left between sections of the material. Shining a light on the junctions, the researchers report, showed current moving across the material, just like a pixel in a traditional camera—one that is not dominated, they point out, by the photothermoelectric effect. This means that the material could conceivably be used inside of a nuclear reactor or in other environments where high-energy lasers are used, such as one utilizing fusion as an energy source. The team reports also that the size of junctions created in the material are dependent on the laser that is used to make them—they were able to create junctions just 250nm wide. They plan to continue their research with the material, looking first to determine if it would be feasible to produce large enough sheets of the material to create an actual camera. 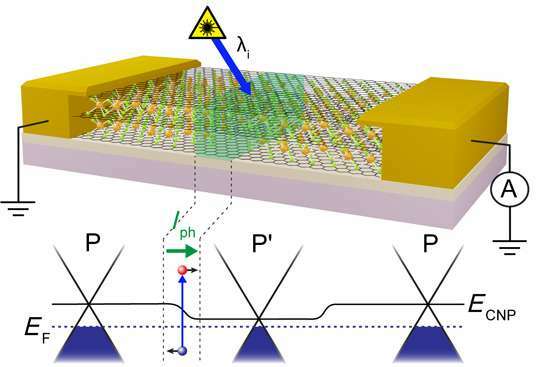 Graphene-based photodetectors have demonstrated mechanical flexibility, large operating bandwidth, and broadband spectral response. However, their linear dynamic range (LDR) is limited by graphene's intrinsic hot-carrier dynamics, which causes deviation from a linear photoresponse at low incident powers. At the same time, multiplication of hot carriers causes the photoactive region to be smeared over distances of a few micrometers, limiting the use of graphene in high-resolution applications. We present a novel method for engineering photoactive junctions in FeCl3-intercalated graphene using laser irradiation. Photocurrent measured at these planar junctions shows an extraordinary linear response with an LDR value at least 4500 times larger than that of other graphene devices (44 dB) while maintaining high stability against environmental contamination without the need for encapsulation. The observed photoresponse is purely photovoltaic, demonstrating complete quenching of hot-carrier effects. These results pave the way toward the design of ultrathin photodetectors with unprecedented LDR for high-definition imaging and sensing.